Are We Running Out of Fossil Fuels? This comment to my post seems to be typical of the thinking of many people around the country and while I have to admit that I did not know the exact number of years of Fossil Fuels available to the world, the numbers above seemed a little out of line. So I decided to do a little research. If you Google the words “Fossil Fuel Reserves” you will find hundreds of hits particularly as the subject pertains to “Climate Change”. The facts that I present below are from sources that are not bias for or against the idea of Climate Change but instead are more interested in the actual calculation of Fossil Fuel Reserves as a matter of scientific and/or economic projection. The fact that this research is the result of a posting on “Green Energy” has nothing to do with the fact that Fossil Fuel Reserves are being depleted, a fact that cannot be disputed. This post is basically for my education (and any one else’s with an open mind). So, with the above disclaimer in mind, I realize that it is difficult to know the exact date that we will run out of carbon based fuel. However a number of scientific organizations have agreed on a fairly consistent level how many years worth of oil, natural gas and coal are left in your reserves. These estimates of course are based on a number of factors (e.g. rate of current world consumption per person, rate of the world’s population increase, and proven reserves for each of the commodities. Just how limited are our fossil fuel reserves? No doubt that is a subject of debate. Some estimates say our fossil fuel reserves will be depleted within 50 years, while others say it will be 100-120 years. The fact is that neither one of these projections is very appealing for a global community that is so heavily dependent on fossil fuels to meet basic human needs. The bottom line: We are going to run out of fossil fuels for energy and we have no choice but to prepare for the new age of energy production since, most certainly, human demands for energy will not decrease. While the World Coal Institute states that supplies should last for the next 119 years the chart below from Shell Oil gives us up to 210 years of Coal supply. But then again, Shell is in the Oil and Gas industry, not necessarily into Coal. The fact is, nobody really knows when the last drop of oil, lump of coal or cubic foot of natural gas will be collected from the Earth. All of it will depend on how well we manage our energy demands along with how well we can develop and use renewable energy sources. And here is one very important factor: population growth. As the population grows upwards towards nine billion people over the next 50 years, the world’s energy demands will increase proportionately. Not only will it be important for renewable energy to keep up with the increasing population growth, but it must outpace not only these demands but begin replacing fossil fuel energy production if we are to meet future energy needs. By the year 2020, world energy consumption is projected to increase by 50%, or an additional 207 quadrillion BTUs. If the global consumption of renewable energy sources remains constant, the world’s available fossil fuel reserves will be consumed in 104 years or early in the 22nd century. (Source: US Department of Energy) Clearly, renewable energy resources will play an increasingly vital role in the power generation mix over the next century. On a worldwide basis, there are 400 Gb (billion barrels) per person. The timescale when this resource is used up is dependent on the world consumption rate, a figure difficult to estimate. A worst case scenario is the “Third World” scenario which has the third world nations aspire to the US consumption rate causing the world rate to double: there would be only 400/24, meaning 17 years left. Although this is a worst case, most best case scenarios offer a resource exhaustion timescale which is at most 3-4 times this value which is 50-70 years. Note that Saudi Arabia produces the same as the US. The US needs 600,000 wells for its production and Saudi Arabia, only 860 wells. This is because the US sits on an old oil field while Saudi Arabia is located over a very young and rich one. Natural gas accounts for 24% of the energy in the United States. Domestic production of natural gas peaked in 1973; this is because we do not import due to safety problems. Consumption of natural gas is actually flat as opposed to increasing usage of coal and oil. Petroleum / Natural Gas will run out in the next 50 years. 97% of fossil fuel reserves are coal. 20% of the world’s coal supply is located in the United States. Energy yield depends on how much carbon is contained in the coal. Two types dominate US reserves. 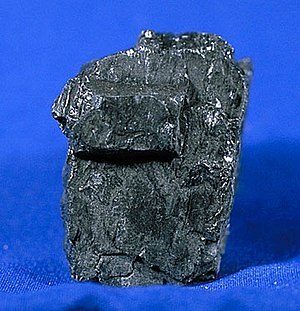 Anthracite is 95% carbon and is approximately 300 million years old. Lignite is 25% carbon is nearly 150 million years old. Deposits are around 300 feet below the surface and typically 2-8 feet thick. Coal production has increased since 1970. At current usage, the supply will last 1500 years. However at a 5% growth rate the supply will last only 86 years. We can expect even greater usage as other fossil fuels become scarce. EarthTrends, a publication of the World Resource Institute is an online collection of information regarding the environmental, social, and economic trends that shape our world. They are, (according to their charter), “committed to the principle that accurate information drives responsible decisions by governments and individuals, EarthTrends offers the public a large breadth of statistical, graphic, and analytical data in easily accessible formats.” The publication has compiled a well detailed lengthy study on “Fossil Fuel Consumption and its Implications.” This one paragraph from the study gives a fairly succinct snapshot of our Fossil Fuel reserves. You will note that each one of the sources above give different timelines for expiration of Fossil Fuels but differences say ten to twenty or maybe fifty years are rather small in the overall scheme of things. So what conclusions can we draw from these varied sources of facts and figures? Regardless as to whether it is 100, 200 or more years, the earth will eventually run out of precious Fossil Fuels. The big question is, can we replace those fuels with alternative energy in time and at what cost? Since publishing this blog, I have had a few comments that the figures quoted are U.S. quantities and that there are far greater supplies available around the world. If so I challenge you to send links prove those facts. In the mean time, I am providing a number of other links regarding the shrinking supply of “Fossil Fuels” that might be of interest. This entry was posted in Green, Green Energy, LEED, Sustainability and tagged Fossil fuel, Natural gas, Renewable energy, World energy resources and consumption. Bookmark the permalink. 4 Responses to Are We Running Out of Fossil Fuels? of work? I have no expertise in computer programming however I was hoping to start my own blog soon. pretty much it. The templates are self explanatory. Hey superb blog! Does running a blog such as this require a massive amount work? please share. I know this is off topic but I simply had to ask. To be honest, the blog part is fairly simple to design and add content. However, if writing does not come naturally then that part would be the most difficult portion of the work. If you want to start a blog then you need to plan your approach and identify your target audience. Do you want your blog to have a mission? Do you want to target one subject or be a log of your random thoughts? Are you trying to be humorous or do you have a serious message.